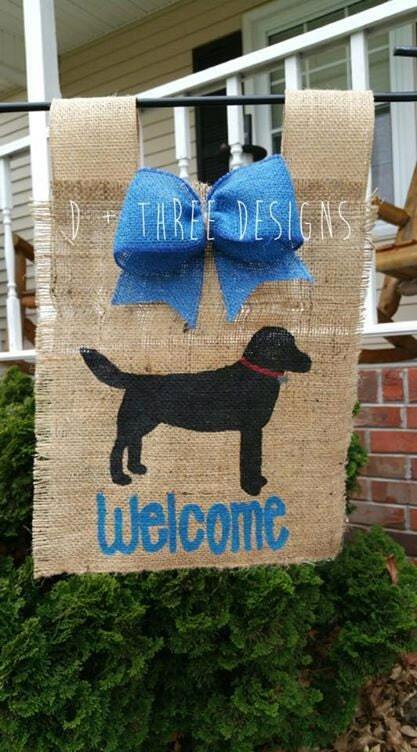 This custom burlap dog painted flag is the perfect addition to any dog lover's home. This flag is sealed and stiffened to ensure long lasting protection. The edges are sealed to prevent unraveling. Dog color can be customized along with collar color and bow color. This flag is approximately a 12 x 11 burlap rectangle. D + Three Designs can customize all flags based on your desires. These flags can also be turned into a door hanger by removing the two burlap hooks at the top and adding a hanger string upon request.